It’s that time of year when the National Archives yield up more of their secrets. The fact that this even happens is underappreciated. Government secrets are necessary though undesirable (sorry, they are, but that’s for another blogpost), but the fact that we have a framework for the eventual release of (most of) them within a generation is rather good really. As we move through the next few years, more and more documents will be released from the 1980s, a decade of unparalleled importance in the recent history of Britain. Individual newspapers will present their Pot Noodle Histories – quick and easy to make, maybe initially satisfying, but ultimately ghastly and bad for your health. A particular area of interest is the revival of 2013’s favourite comparison: Mandela v Thatcher. The claim being advanced by The Guardian this morning is that Thatcher, contrary to the claims of her supporters, applied very little pressure on South African President PW Botha to release Mandela. This is presented under the broad historical statement “Margaret Thatcher 'made no case' for Mandela's release”, and the article has been doing the rounds on twitter. Interestingly, Kevin Maguire of the Daily Mirror decided to tweet this article, rather than using anything from his own paper. As readers, we must be very careful here, because the statement in that headline simply isn’t true, and it is an example of how newspapers, particularly in the age of the 140-character-history, manipulate the facts. The newly released documents from 1984 certainly demonstrate that Thatcher was not exerting tremendous pressure for Mandela’s release, but she was attempting diplomatic ways of influencing significant change in the Apartheid regime, having decided that isolation was not the best way to get peaceful progress in South Africa. These methods were, naturally, incremental. By 31st October 1985, Margaret Thatcher wrote this letter to Botha, in which she explicitly urges him to release Nelson Mandela. It also shows how many plates Thatcher was spinning, throughout the Commonwealth and worldwide in the pursuit of her foreign policy. One can debate her decisions and question how successful and influential her tactics were, but the suggestion that she was a supporter of the Apartheid division is just plain wrong, nor is it correct to say that she “made no case” for Mandela’s release. Now, in fairness to The Guardian, the article does detail a lot of facts that place Thatcher in a good light, noting that she told Botha that it was “totally unacceptable” that rights were determined by skin colour, and it is also made apparent that the Government at that time had supported calls for Mandela’s release. However, that doesn’t prevent the headline being poor history, and the structure of the article being such as to encourage a view of history that is erroneous but beneficial to that paper’s particular worldview. What that amounts to is total intellectual dishonesty. We don’t tolerate this sort of nonsense from The Daily Mail, and rightly so. We must be consistent. Of course, all papers do this. As Charlie Brooker noted in his excellent 2013 Wipe, a large part of the job of newspapers is to spew the readers’ views back at them, and no doubt someone will find that the Mail has been hagiographic to a fault today (I refuse to take the Mail unless absolutely necessary). Nevertheless, we owe it to ourselves to be better. We should read wider, consider more calmly and, hard though it might be, resist the urge to reduce everything to 140 characters, nor to think that any single tweet contains the truth, the whole truth and nothing but the truth. The Royal Mint has unveiled new designs for coins in 2014. Amongst them is the first of many commemorative coins to mark the centenary of the First World War. The design features the infamous poster “Lord Kitchener Wants You”. At the same time, Michael Gove has attacked dramas such as Blackadder for spreading left wing myths about the First World War, arguing that they have served to create a simplistic narrative where the blundering elite sent thousands upon thousands to unnecessary deaths. The centenary is a deeply difficult time to navigate, but the government is botching it in typically schoolboy, Ripping Yarns-esque style. Whilst I agree with Gove that the common view of the First World War has become lacking in nuance and simplistic, it doesn’t take away from the fact that the conflict was preceded by the needless power-games of the nations involved, and defined by the obsolescence of their strategies and the incredible wasting of human life in absolutely hopeless and pointless endeavours. The horror of what happened (which, incidentally, Blackadder Goes Forth portrayed magnificently) is what must be remembered. The Government’s rhetoric seems utterly opposed to this, seeking commemoration rather than remembrance and some kind of reconsideration of WW1 as a noble conflict. Gove sees it as a glorious fight against Social Darwinism. It wasn’t. It was the hideous extension of 19th Century wars of conquest, imperialism and pride, driven by opportunism, ambition and the lust for vengeance. Minting a coin to commemorate this, and using a poster which ultimately sent huge numbers of men to a vain and pitiless death, is just sick. There was a muted outcry at the end of the year, as Andy Murray went unrecognised in the New Year’s Honours List. Murray, who collected an OBE from the 2012 list during the last year, had been widely tipped to receive a knighthood after winning the Wimbledon Men’s Singles Titles last July. 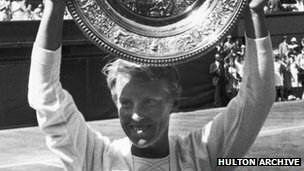 Meanwhile, Ann Jones, Ladies’ Singles Champion in 1969 received a CBE. The expectation that Murray was to receive a knighthood whilst Jones has only just now received a CBE (largely in recognition of her work in tennis administration), indicates the persistent and irrational sexism that pervades our perception of sport in general. Tennis is now one of the most egalitarian sports in terms of pay, but we still seem to treat female players with less regard. Whilst one may enjoy in a purely emotive way one gender’s game more than the other’s (perhaps enjoying the higher speed that the Men’s game is played at, for instance), it is ridiculous to treat the achievements of female players any less. Murray will eventually get his knighthood. He deserves it, but if that is so then Jones and Virginia Wade (the last female winner of Wimbledon, who currently has an OBE) should be Dames.